Time for the second review in our week of Lost in Science Fiction, aka science in the movies. Our first film was not so accurate, but let’s see if we do better with Moon (2009), directed by Duncan Jones, aka Zowie Bowie, and starring almost solely Sam Rockwell. This is one of those annoying movies with a twist, so I can’t say too much about what happens (although recent research has shown that spoilers can actually make stories better). But suffice to say it’s about a guy (Sam Rockwell) living on the Moon, with only a computerised Kevin Spacey for company. He’s there to mine for helium-3, an isotope that has one less neutron than the more common helium-4 (which has two neutrons and two protons in its nucleus. Helium-3 still has the two protons and hence the same chemical properties, but lacking a second neutron it has a lower atomic weight). Helium-3 has been suggested as a possible fuel for nuclear fusion: two helium-3 nuclei can combine to create one helium-4 nucleus and two protons, as well as a whole lot of energy. It’s also used in neutron detectors and to achieve extremely low temperatures in cryogenics. The trouble is that helium-3 is extremely rare, about 1/10,000th the abundance of helium-4, or around 7.2 parts per trillion in the atmosphere. In fact, most of the helium-3 used on Earth is manufactured. However, the situation on the Moon is more promising. The lunar regolith, or dirt, may contain up to 50 parts per billion on some parts of the surface. As a result, mining the Moon for helium-3 is a potentially lucrative industry, and it seems to be one of the main reasons the various spacefaring nations are once more interested in lunar exploration. So, for an interesting depiction of this potential future industry – with a fascinating psychological twist – check out the movie Moon. Or if you want to try helium-3 mining for yourself, have a go at the Helium-3 Space Game on YourDiscovery.com. How much of what you know about science comes from school, university, scientific papers, cool blogs and radio shows, and how much comes from movies and TV shows? This question was put to the test by researchers from Boston College, USA. 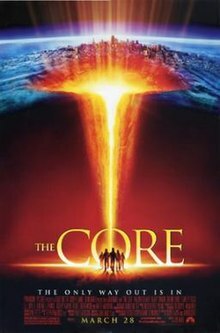 Using members of an 8th grade science class who had studied the structure of the Earth, they exposed half of them to the Hollywood movie The Core (2003), then compared how much their understanding changed compared to students who were left unsullied. The results showed that explanations given by the main scientist character (played by Aaron Eckhart) were accepted because they sounded plausible and hey, he looked plausible. But also, what the students saw in the movie was more memorable and often replaced what they learned in class. While we’re all waiting for the new series of Doctor Who to start, ABC television has been kindly showing repeats of the previous season. Which actually is a tradition they’ve kept pretty much for as long as the show’s been on the air. Two of the episodes they’ve repeated recently involved the Silurians, intelligent reptiles who retreated to underground refuges before humans developed intelligence, and which first appeared in the original series of Doctor Who, with much hokier costumes, back in 1970. Needless to say, the science in this is spectacularly wrong. But as is so often the case, the way it’s wrong is itself instructive. First, there’s their name. The Doctor claims they’re formally called Homo reptilia. Now, the scientific name for a species uses binomial nomenclature, made out of the genus and the species names. Homo is the genus to which humans belong, in the family Hominidae, the order Primates and the class Mammalia. Whereas reptiles are the class Reptilia. Taxonomy forms a branching structure, so a reptile, no matter how human it looks, can’t be in the same genus as mammals like us. Then there’s their unofficial name: the Silurians. This is stated to be a misnomer, but there actually was a Silurian period in Earth’s prehistory. Except it was from 443.7-416 million years ago, long before reptiles or other vertebrates evolved, let alone left the sea (to find out more, see 600 Million Years at the Melbourne Museum). The other clue the Silurians give is that they hid underground to avoid an approaching asteroid that never actually hit the Earth, instead going into orbit and becoming the Moon. This one is really interesting: in 1970, this “capture theory” was a leading contender for explaining the formation of the Moon. But at a conference in Hawaii in 1984, it and other theories were replaced by the “impact hypothesis”, which says that the Moon was formed by an actual collision with an object about the size of Mars. This is believed to have happened around 4.5 billion years ago, long before life of any kind formed on Earth. But let’s be fair: we know it’s wrong now, but when the Silurians were first created, it was a pretty good idea. Now, to biology. Intelligent, humanoid reptiles are themselves quite a cliché, but it’s actually unlikely that evolution would produce something that looks so much like humans (the female Silurians even seem to have breasts, yet these are meant to be reptiles!). I’d go into more detail, but Darren Naish explains it much better on his blog Tetrapod Zoology (I particularly like the idea that they’d be more birdlike, or Avisapiens). There’s probably a lot more to say about the biology, but I’ll just mention one more thing: the long, flexible tongue with a venomous sting on the tip. Now, as we’ve seen, nothing else about them seems to match real science, so how can we really say what’s acceptable? Well, we can at least say is that nothing else in the world seems to have this biology. The obvious comparison is with snakes, which do have a long tongue, but their venom comes from modified saliva glands behind their eyes, and is then channeled through tubes in the fangs. So no, not so accurate. But at least they dropped the third eye and the heat ray. The Earth has been particularly active lately. It’s easy for us to forget, running around on the surface as we do, that there’s a lot more going on beneath our feet. The rocks we’re familiar with are merely the crust on the surface, between 5 km (under the ocean) and 50 km thick. Beneath that is about 2,890 km of mantle, a 2,266 km thick liquid outer core and a solid inner core, which has a radius of 1,216 km. And of course, it’s really, really hot down there. Thanks to radioactive decay, warming from the sun and heat left over from the Earth’s formation 4.5 billion years ago (kept under great pressure), the inner core is believed to be as hot as 5505 °C. That’s about the same as the surface of the sun. 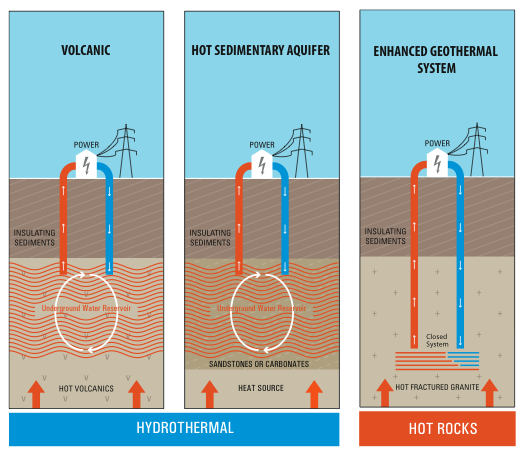 Such an enormous amount of heat has to be good for something, and it is: we can use it to generate geothermal energy. What’s all this talk about the “magnitude” of an earthquake? 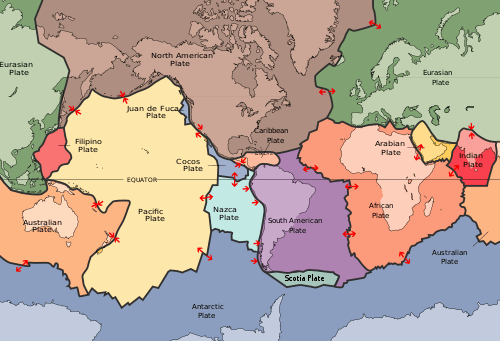 Whatever happened to the Richter scale? I’m glad you asked. The moment magnitude scale has gradually taken the place of the Richter scale since 1979, when it was developed by Hiroo Kanamori and Tom Hanks (no, not that Tom Hanks). It’s designed to be more reliable for larger events, being based on the energy released by the quake rather than how much the ground has moved. Actually, it’s based on the logarithm of the energy, meaning that the scale goes up by one when the energy goes up by a factor of 10. There are many measurement scales based on logarithms, from pH to decibels, stellar magnitude to information, even the octave scale. In fact there is evidence to suggest that human beings find it more natural to estimate quantities based on logarithmic scales. In the 19th century, Ernst Heinrich Weber and Gustave Theodor Fechner performed experiments like gradually increasing weights held by blindfolded people. Small increases were barely perceptible, but when the weight was increased by an amount comparable to what it started with, it could easily be detected – regardless of the starting weight. As is often the case, the maths may sound complicated, but we’re awfully good at doing it subconsciously. I’m sure that many of you, like me, have been shocked by yesterday’s tragedy in New Zealand. Christchurch is a beautiful city, which I’ve been fortunate enough to visit twice in the past year – my thoughts are with all those affected, especially those who’ve lost loved ones or are still trapped in the rubble. Unfortunately, science still can’t predict when earthquakes are going to strike. But we do know why they happen, and we learn more each time. John, who always likes to seek out extremes, this week dug up the Kola Superdeep Borehole, the deepest hole ever drilled at 12.262 km beneath the Earth. Although they reached this depth in 1989, drilling actually began 19 years earlier in 1970, when Russia was part of the Soviet Union. The borehole sits on and under the Kola Peninsula, in Lapland at the very north-west of Russia, and part of Murmansk Oblast (word of the day: oblast, an administrative division or province of Russia and other Slavic countries like Ukraine and Belarus. Present-day Russia has 46 oblasts, as well as various republics and krais, or territories). You can read more about this Russian marvel at Wikipedia.